For other uses, see Flying saucer (disambiguation). October 1957 issue of Amazing Stories magazine devoted to flying saucers. The sightings starting in 1947 ignited an obsession with flying saucers that lasted a decade. A flying saucer (also referred to as "a flying disc") is a descriptive term for a supposed type of flying craft having a disc or saucer-shaped body, commonly used generically to refer to an anomalous flying object. The term was coined in 1930 but has generally been supplanted since 1952 by the United States Air Force term unidentified flying objects or UFOs. Early reported sightings of unknown "flying saucers" usually described them as silver or metallic, sometimes reported as covered with navigation lights or surrounded with a glowing light, hovering or moving rapidly, either alone or in tight formations with other similar craft, and exhibiting high maneuverability. While disc-shaped flying objects have been interpreted as being sporadically recorded since the Middle Ages, the first recorded use of the term "flying saucer" for an unidentified flying object was to describe a probable meteor that fell over Texas and Oklahoma on June 17, 1930. "Some who saw the weird light described it as a huge comet, a flaming flying saucer, a great red glow, a ball of fire." The term "flying saucer" had been in use since 1890 to describe a clay pigeon shooting target, which resembles a classic UFO shape. The highly publicized sighting by Kenneth Arnold on June 24, 1947, resulted in the popularity of the term "flying saucer" by U.S. newspapers. Although Arnold never specifically used the term "flying saucer", he was quoted at the time saying the shape of the objects he saw was like a "saucer", "disc", or "pie-plate", and several years later added he had also said "the objects moved like saucers skipping across the water." Both the terms flying saucer and flying disc were used commonly and interchangeably in the media until the early 1950s. Arnold's sighting was followed by thousands of similar sightings across the world. Such sightings were once very common, to such an extent that "flying saucer" was a synonym for UFO through the 1960s before it began to fall out of favor. A lot of sightings of the cigar-shaped UFO were reported following it. More recently, the flying saucer has been largely supplanted by other alleged UFO-related vehicles, such as the black triangle. In fact, the term UFO was invented in 1952, to try to reflect the wider diversity of shapes being seen. However, unknown saucer-like objects are still reported, such as in the widely publicized 2006 sighting over Chicago-O'Hare airport. 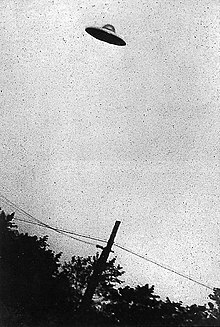 Many of the alleged flying saucer photographs of the era are now believed to be hoaxes. 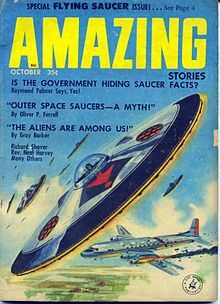 The flying saucer is now considered largely an icon of the 1950s and of B movies in particular, and is a popular subject in comic science fiction. Beyond the common usage of the phrase, there have also been man-made saucer-like craft. The first flying disc craft was called the Discopter and was patented by Alexander Weygers in 1944. Other designs have followed, such as the American Vought V-173 / XF5U "Flying Flapjack", the British GFS Projects flying saucer, or the British "S.A.U.C.E.R." ("Saucer Aircraft Utilising Coanda Effect Reactions") flying saucer, by inventor Alf Beharie. News notice printed in Nuremberg, describing 4 April 1561 Nuremberg mass sighting. Discs and spheres were said to emerge from large cylinders. From Wickiana collection in Zurich. A manuscript illustration of the 10th-century Japanese narrative, The Tale of the Bamboo Cutter, depicts a round flying machine similar to a flying saucer. A record of a saucer-shaped object is from 1290 of a silver disc flying over a village in Yorkshire. Disc-like flying objects were occasionally reported throughout the millennium. 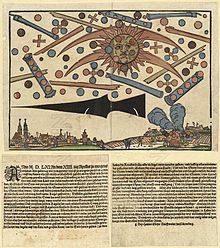 For example, in a mass sighting over Nuremberg in 1561, discs and spheres were reported emerging from large cylinders (see woodcut at left). They are also claimed by ufologists to frequently show up in religious artwork. Another well-documented specific comparison of the objects to saucers was the Kenneth Arnold sighting on June 24, 1947, while Arnold was flying near Mount Rainier. He reported seeing 9 brightly reflecting vehicles, one shaped like a crescent but the others more disc- or saucer-shaped, flying in an echelon formation, weaving like the tail of a kite, flipping and flashing in the sun, and traveling with a speed of at least 1,200 miles per hour (1,900 km/h). In addition to the saucer or disc shape (Arnold also used the terms "pie plate" and half-moon shaped), he also later said he described the motion of the craft as "like a saucer if you skip it across water", leading to the term "flying saucer" and also "flying disc" (which were synonymous for a number of years). Immediately following the report, hundreds of sightings of usually saucer-like objects were reported across the United States and also in some other countries. The most widely publicized of these was the sighting by a United Airlines crew on July 4 of nine more disc-like objects pacing their plane over Idaho, not far from Arnold's initial sighting. On July 8, the Army Air Force base at Roswell, New Mexico issued a press release saying that they had recovered a "flying disc" from a nearby ranch, the so-called Roswell UFO incident, which was front-page news until the military issued a retraction saying that it was a weather balloon. On July 9, the Army Air Force Directorate of Intelligence, assisted by the FBI, began a secret study of the best of the flying saucer reports, including Arnold's and the United Airlines' crew. Three weeks later they issued an intelligence estimate describing the typical characteristics reported (including that they were often reported as disc-like and metallic) and concluded that something was really flying around. A follow-up investigation by the Air Materiel Command at Wright Field, Ohio arrived at the same conclusion. A widespread official government study of the saucers was urged by General Nathan Twining. This led to the formation of Project Sign (also known as Project Saucer) at the end of 1947, the first public Air Force UFO study. This evolved into Project Grudge (1949–1951) and then Project Blue Book (1952–1970). The term "flying saucer" quickly became deeply ingrained in the English vernacular. A Gallup poll from August 1947 found that 90% had heard about the mysterious flying saucers or flying discs, and a 1950 Gallup poll found that 94% of those polled had heard the term, easily beating out all other mentioned commonly used terms in the news such as "Cold War", "universal military training", and "bookie". Air Force statistics indicated that the basic saucer-shape continued to be the most commonly reported one through the 1950s and 1960s until Project Blue Book ended in 1970. There have been some claims, still undocumented by scientific study, that reports of saucers began to decline in the 1970s, being supplanted by other craft such as black triangles, cylinders, and amorphous shapes. It has also been asserted that despite the increase in portable cameras, photographs dwindled as Cold War and Space Race interest decreased and a number of notable images were exposed as fakes. A lenticular cloud. Studies show such clouds account for less than 1% of flying saucer reports. In addition to the extraterrestrial hypothesis, a variety of possible explanations for flying saucers have been put forward. One of the most common states that most photos of saucers were hoaxes; cylindrical metal objects such as pie tins, hubcaps and dustbin lids were easy to obtain, and the poor focus seen in UFO images makes the true scale of the object difficult to ascertain. However, some photos and movies were deemed authentic after intensive study. An example was the saucer-like object photographed by farmer Paul Trent near Portland, Oregon in 1950, which passed all tests when studied by the Condon Committee in the 1960s. Another theory states that most are natural phenomena such as lenticular clouds and balloons, which appear disc-like in some lighting conditions. A third theory puts all saucer sightings down to a form of mass hysteria. Arnold described the craft he saw as saucer-like but not perfectly round (he described them as thin, flat, rounded in front but chopped in back and coming to a point), but the image of the circular saucer was fixed in the public consciousness. The theory posits that as the use of the term flying saucer in popular culture decreased, so too did sightings. One of the first depictions of a "flying saucer", by illustrator Frank R. Paul on the October 1929 issue of Hugo Gernsback's pulp science fiction magazine Science Wonder Stories. Although the term wasn't used before 1947, fantasy artwork in pulp magazines prepared the American mind to be receptive to the idea of "flying saucers". The point is that the idea of space vehicles shaped like flying saucers was imprinted in the national psyche for many years prior to 1947, when the Roswell incident took place. It didn't take much stretching for the first observers of UFOs to assume that the unknown objects hovering in the sky had the same disk shape as the science fictional vehicles. A scientific and statistical analysis of 3200 Air Force UFO cases by the Battelle Memorial Institute from 1952 to 1954 found that most were indeed due to natural phenomena, about 2% were due to hoaxes or psychological effects and only 0.4% were thought due to clouds. Other very minor contributors were birds, light phenomena such as mirages or searchlights, and various miscellany such as flares or kites. The vast majority of identified objects (about 84%) were explained as balloons, aircraft, or astronomical objects. However, about 22% of all sightings still defied any plausible explanation by the team of scientists, and percentage of unidentifieds rose to 33% for the best witnesses and cases. Thus when carefully studied, a substantial fraction of reports (given the available data) is currently not understood. 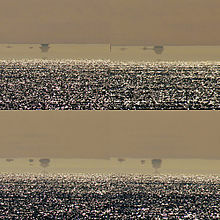 Fata Morgana, a type of mirage, may be responsible for some flying saucers sightings, by displaying objects located below the astronomical horizon hovering in the sky, and magnifying and distorting them. Fata Morgana was named as a hypothesis for the mysterious Australian phenomenon Min Min light. Other attempts have been made, with limited success, to produce manned vehicles based on the flying saucer design. While some, such as the Avrocar and M200G Volantor have been produced in limited numbers, most fail to leave the drawing board. The Avrocar, with vertical takeoff and landing, was originally intended to replace both the Jeep and the helicopter in combat situations, but proved to be inadequate for both. In spite of a powerful turbojet, it could not rise more than four or five feet off the ground, i.e., out of ground effect. 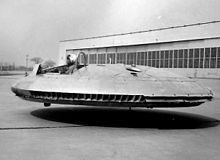 Thus, the Avrocar could be seen as a prototype for the early generations of hovercraft, lacking only a 'skirt' to make it a truly effective example of the type. Unmanned saucers have had more success; the Sikorsky Cypher is a saucer-like UAV which uses the disc-shaped shroud to protect rotor blades. Some more advanced flying saucers capable of spaceflight have been proposed, often as black projects by aeronautics companies. The Lenticular Reentry Vehicle was a secret project run by Convair for a saucer device which could carry both astronauts and nuclear weapons into orbit; the nuclear-powered system was planned in depth, but is not believed to have ever flown. More exotically, British Rail worked on plans for the British Rail "Space Vehicle" a proposed, saucer-shaped craft based on so far undiscovered technologies such as nuclear fusion and superconductivity, which was supposed to have been able to transport multiple passenger between planets, but never went beyond the patent stage. There is at least one design that received a US patent in 2005: U.S. Patent 6,960,975 It claims to be "propelled by the pressure of inflationary vacuum state". Additionally, a professor at the University of Florida has begun work on a Wingless Electromagnetic Air Vehicle (WEAV) for NASA which has received public interest because of its coincidental resemblance to a flying saucer. A small flying saucer leaves its larger mothership in Plan 9 from Outer Space (1959). 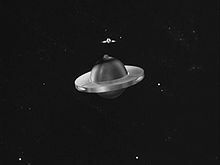 After 1947, the flying saucer quickly became a stereotypical symbol of both extraterrestrials and science fiction, and features in many films of mid-20th century science fiction, including The Atomic Submarine (1959), The Day the Earth Stood Still (1951), Plan 9 from Outer Space (1959), Earth vs. the Flying Saucers (1956), as well as the television series The Invaders. As the flying saucer was surpassed by other designs and concepts, it fell out of favor with straight science-fiction moviemakers, but continued to be used ironically in comedy movies, especially in reference to the low-budget B movies which often featured saucer-shaped alien craft. However, Metro-Goldwyn-Mayer gave its high production value film Forbidden Planet (1956) a flying saucer called the United Planets Cruiser C-57D, presenting a plausible human exploration, faster-than-light starship of the 23rd century. In the television series Lost in Space (1965-1968), the Robinson family had a disc-shaped spaceship. Saucers appeared in the television series Babylon 5 (1994-1998) as the standard ship design used by a race called the Vree. Aliens in the film Independence Day (1996) attacked humanity in giant city-sized saucer-shaped spaceships. The sleek, silver flying saucer in particular is seen as a symbol of 1950s culture; the motif is common in Googie architecture and in Atomic Age décor. The image is often invoked retrofuturistically to produce a nostalgic feel in period works, especially in comic science fiction; both Mars Attacks! (1996) and Destroy All Humans! draw on the flying saucer as part of the larger satire of 1950s B movie tropes. The Twilight Zone episodes "The Monsters Are Due on Maple Street", "Third from the Sun", "Death Ship", "To Serve Man", "The Invaders" and "On Thursday We Leave for Home" all make use of the iconic saucer from Forbidden Planet. ^ a b Associated Press (19 June 1930). "Whicitan Among those Who Saw Meteor". Wichita Daily Times. p. 28. ^ "Shooting Notes". Dayton Herald (p. 4). 19 February 1890. Retrieved 8 May 2018. ^ Essay: A FRESH LOOK AT FLYING SAUCERS. TIME. Aug 4, 1967./ 1975-Loring Air Force Base UFO Sightings Archived 19 June 2015 at the Wayback Machine. about. com./ NASA Helioviewer: Giant Cigar-Shaped UFO Spotted Moving Close To The Speed Of Light?. INQUISITR. January 21, 2015./ 'Cigar-shaped' UFO spotted hovering over erupting Mexican volcano. the Daily and Sunday Express. May 5, 2015./ Retrieved all June 19, 2015. ^ "Sir Patrick Moore's Irish UFO film identified". BBC. Retrieved 23 March 2013. ^ Richardson, Matthew (2001). The Halstead Treasury of Ancient Science Fiction. Rushcutters Bay, New South Wales: Halstead Press. ISBN 1-875684-64-6. ^ "Once Upon a Time". Emerald City (85). September 2002. Retrieved 23 March 2013. ^ a b "Invaders from Elsewhere". Strange Magazine. Retrieved 23 March 2013. ^ "Historical artwork and UFOs by Matthew Hurley" (PDF). Archived from the original (PDF) on 26 April 2013. Retrieved 23 March 2013. ^ "ART and UFO – Intro". Sprezzatura.it. 12 November 2002. Retrieved 23 March 2013. ^ Bloecher, Ted (2005) . Report on the UFO Wave of 1947 (PDF). National Investigations Committee on Aerial Phenomena. Retrieved 7 January 2013. ^ Maccabee, Bruce. "The Trent Farm Photos". Bruce Maccabee. Archived from the original on 21 March 2013. Retrieved 23 March 2013. ^ "Lenticular cloud UFOs". UFO Mistakes. Archived from the original on 4 March 2012. Retrieved 23 March 2013. ^ Law, Stephen (2003). The Outer Limits: More Mysteries from the Philosophy Files. Orion Books. ISBN 1-84255-062-4. 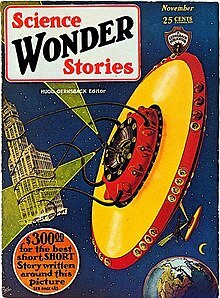 ^ "Early 20th Century magazine covers with "flying saucer"-like craft". Ufopop.org. Retrieved 23 March 2013. ^ Darr, Jennifer (3 July 1997). "Coming To A Sky Near You". Philadelphia Citypaper. Archived from the original on 1 October 2015. Retrieved 1 April 2015. ^ Pettigrew, JD. (2003). "The Min Min light and the Fata Morgana. An optical account of a mysterious Australian phenomenon". Clinical and Experimental Optometry. 86 (2): 109–20. doi:10.1111/j.1444-0938.2003.tb03069.x. PMID 12643807. ^ "OZN-ul lui Coandă, fascinanta creație care a înlemnit America!". Go4it.ro. 3 September 2010. Retrieved 23 March 2013. ^ "Aeronautics – Henri Coanda". Allstar.fiu.edu. Retrieved 23 March 2013. ^ Winchester, Jim (2005). American Military Aircraft. Grange Books PLC. p. 68. ISBN 978-1-84013-753-8. Retrieved 23 March 2013. ^ "British Rail flying saucer plan". BBC. 13 March 2006. Retrieved 23 March 2013. ^ "New Flying Saucer Runs on Plasma". LiveScience. 12 June 2008. Retrieved 23 March 2013. ^ "WEAV – Patent Application For A Plasma-Propelled Flying Saucer". science20.com. 13 June 2008. Retrieved 23 March 2013. ^ "The World's First Flying Saucer: Made Right Here on Earth: Scientific American". Sciam.com. 7 July 2008. Retrieved 23 March 2013. ^ "Astronomers and the Space Needle". Astroprof's. Retrieved 23 March 2013. ^ "Alien Notions". Metroactive. Retrieved 23 March 2013. ^ "Destroy All Humans! for PS2". GameSpot. Archived from the original on 11 April 2013. Retrieved 23 March 2013. Adamski, George (1953). Flying Saucers Have Landed. London: Spearman. Adamski, George (1955). Inside the Space Ships. New York: Abelard-Schuman.